No, not the sexual-acrobatics-love-scene sort of flexibility! I’m talking about pajamas-with-elastic-waistbands flexibility. The kind of flexibility that lets me work from home, at whatever hours I choose. Of course, this flexibility can come back to bite me when a deadline is staring me in the face, and I find myself working around the clock! Not having a supervisor standing over my shoulder also means that I’m responsible for keeping myself off Facebook and BuzzFeed, which can be a greater challenge then you might suppose. However, when all is tallied up, the advantages win out. I’m around when my kids need me. I can take my notebook to the park, or a coffeehouse, or the library when I need a change of scenery. And if I want a cuddle, one of my three cats is always nearby. No, not the wink-wink, nudge-nudge sort of research that my husband’s friends love to tease about. I’m referring to the musty-library-books and internet-rabbit-hole kind of research. As a former librarian, I love nothing more than delving into the history of my settings and characters. I have requested books from the Library of Congress and visited rare volumes in the reading room of the New York Public Library. The best part, however, is when research requires me to travel! My research has taken me from caves to castles, breweries to barns. And there are a few jobs other than Regency romance author that can legitimately justify a tax-deductible stay in a posh Mayfair hotel, all in the name of research. Yes, I do mean that kind of love. In fact, I mean all the kinds of love, from butterflies-in-the-stomach infatuation, to the enduring commitment of happily-ever-after. Writing isn’t always an easy task, but it’s wonderful that romance writing primarily involves thinking about love, noticing people in love, examining emotions that bring people together, and putting it all down on the page. Best of all, when we send our stories out into the world, Romance writers often get love in return. Authors receive heartwarming, and sometimes heartrending, letters from readers who’ve invited our books and characters into their lives when they needed a laugh, a distraction, a ray of hope, or even a brief respite from grief. When it comes down to it, romance writers are in the business of love – reading it, writing it, feeling it, sharing it. And it’s the best business I can imagine. 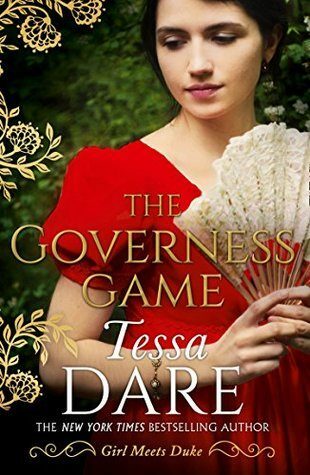 The Governess Game is Out NOW!!! This is such a lovely book, I loved Alexandra and Chase together, you don’t want to miss it !! Get it Here!!! Tessa Dare is the New York Times and USA Today bestselling author of thirteen historical romance novels and four novellas. Her books have won numerous accolades, including Romance Writers of America’s prestigious RITA® award and multiple RT Book Reviews Reviewer’s Choice Awards. Booklist magazine named her one of the “new stars of historical romance,” and her books have been contracted for translation in more than a dozen languages.